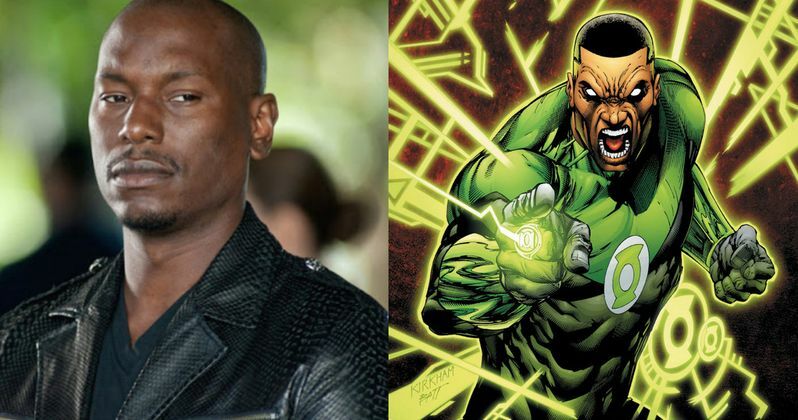 Tyrese Gibson to Play Green Lantern in Justice League? Way back in October of last year, when DC Comics and Warner Bros. unveiled it's full slate of upcoming movies, they also announced most of the Justice League cast. The one main character that didn't come attached to an actor was Green Lantern. Though, before and since that time a number of names have been rumored to portray John Stewart. One of those often mentioned names is Tyrese Gibson. He has decided to fuel the flames, almost lobbying for the part, by posting new fan art that depicts himself as the character. Raphael Leite created the image in question for D&R Arts, which was posted on Facebook. The image was later shared by Tyrese himself on his Instagram Account with the words: 'Rumor Has It. 'This is similar to the approach that Jason Momoa took when he was rumored to be playing Aquaman. He constantly teased fans on social media with images hinting that he had taken on the character, but then vehemently denied it whenever he was asked directly in a public forum. He was later made part of the October announcement. Its possible that we didn't hear any Green Lantern casting news at that time, because the Green Lantern (Reboot) is the final movie to be released as part of this first wave of DC Comics films, with his solo adventure coming in 2020. It's also been rumored that Green Lantern doesn't show up until the end of Justice League Part 1, when he arrives to warn the rest of the team that Darkseid is coming. He will then be a main character in Justice League Part 2. It has long been rumored that this version of Green Lantern will focus on John Stewart, as DC tries to distance itself from Ryan Reynolds' Hal Jordan in the 2011 Green Lantern, considered a failure by most fans and critics alike. With no immediate need to have a new Green Lantern cast, that may be why we haven't heard anything. Justice League Part 1 isn't in theaters until 2017, so Warner Bros. still has a little bit of time to make up it's mind, if it hasn't already. What do you think? Take a look at the below art, and let us know, is this the Green Lantern you want to see rebooted on the big screen?